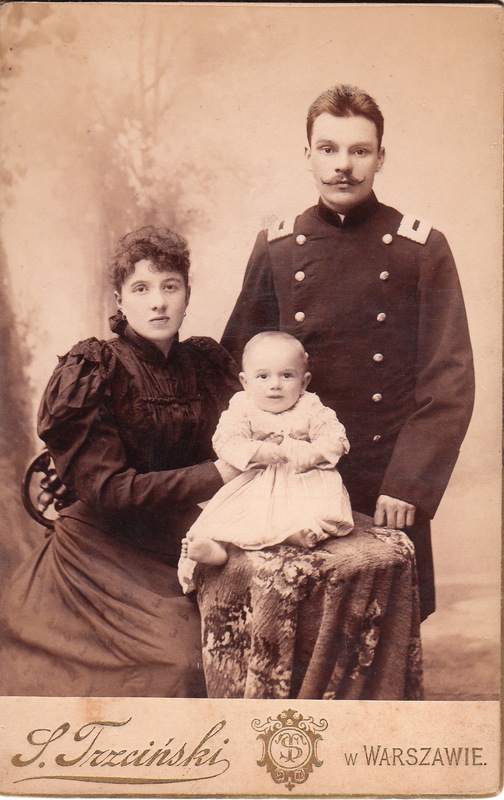 This cabinet card features a Polish military officer posing with his wife and smiling baby at the studio of S. Trzcinski in Warsaw, Poland. The three men posing for this portrait have an intriguing appearance. Who are these guys? What do they do for a living? They look like “tough guys”. The men are well dressed and are wearing terrific hats with brims folded in strategic places. 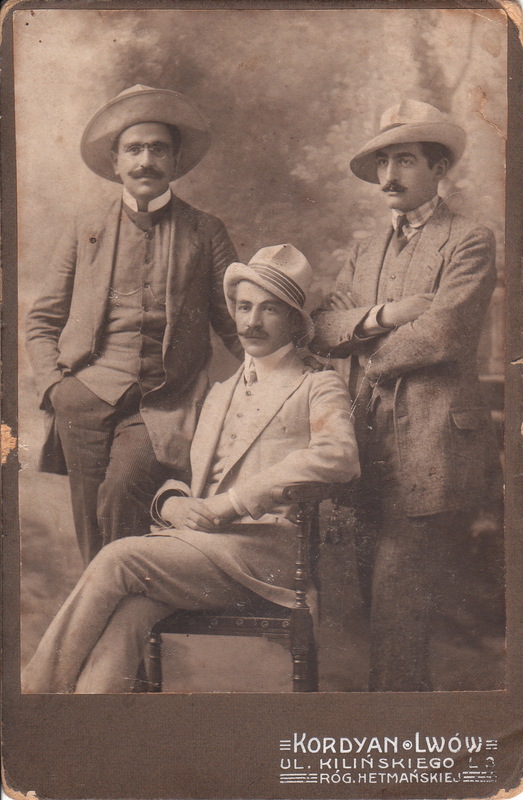 All three men have neat mustaches and the fellow on the left is wearing wire rim glasses. The photo studio was named Kordyan and the studio was located in Lwow, Poland. In 1945, Lwow became part of the Ukraine and was called Lvov. In 1991, after Ukraine’s independence, the city was renamed Lviv. Research reveals that the studio Kordyan was opened on the 5th floor in a building now housing the “Old City Hostel”. The gallery existed in the building until 1914 and was owned by Bethold Feyershtayn. The address is currently known as 3 Klinskoho Street. This cabinet card photograph appears to have been photographed in the studio of B. Wilkoszewski of Lodz, Poland (things aren’t always as they appear to be). At the time of this photograph, the city was likely under the rule of Russia, and Wilkoszewski no longer owned the studio. The gentleman in this image is very well dressed and is holding a cane. 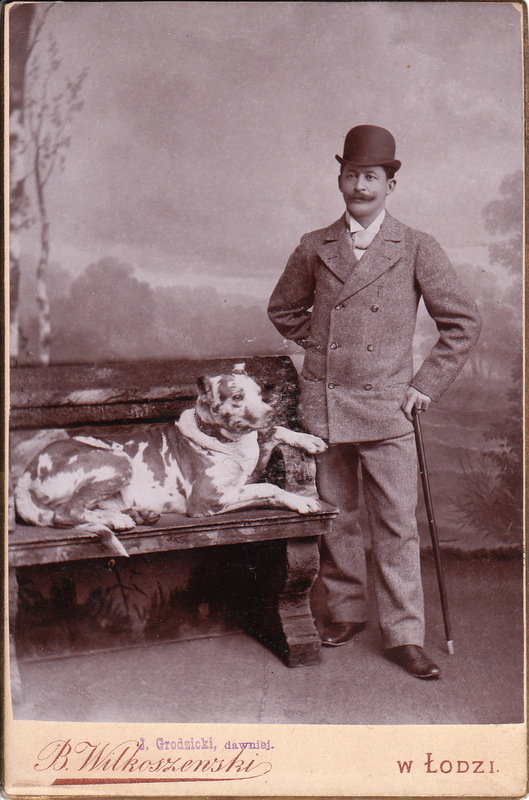 He is posed in a faux park scene and stands next to his very large dog, who appears to have taken ownership of the park bench. The dog’s coat could be used to give the Rorschach Ink Blot Test to psychiatric patients. The cabinet card is stamped on the front and back of the photograph with the name “J. Grodzicki” , and next to the name is the word “dawniej”. Research reveals that “dawniej” is the Polish word for “formerly”. Therefore, the actual photographer of this image is J. Grodzicki, and Wilkoszewski was the former owner of the studio. A proud mother and her three children pose for their family portrait in Wloclawku, Poland. The photographer is B. Sztejner. Two adorable kids (most likely siblings) pose in this Cabinet card photograph. The close-up of the baby is terrific and is an unusual pose for photographs of this era. Most babies I have seen in Cabinet cards are photographed from more of a distance. The photograper is Make of Gnesen. My research leaves me uncertain of whether Gnesen was part of Prussia or Germany at the time of this photograph. Please comment if you have information about what nation Gnesen was part of in the late 1800’s. Gnesen is currently part of Poland. These two siblings are just adorable as they pose in the Germania Studio in Beuthen, Germany. Unlike many children seen in Cabinet Cards, these kids appear very relaxed and in good humor. The boy is cute in his sailor suit and the girl is holding a toy ball. The city of Beuthen is now called Bytom and is in southern Poland. Beuthen became part of Prussia in 1742 and part of the German empire in 1871. Beuthen was transferred to Poland in 1945.